"ULTRAMAN" TURNS 50 THIS MONTH: JULY 2016! "TV Guide" full-page color preview (Tokyo News Service, Ltd.). 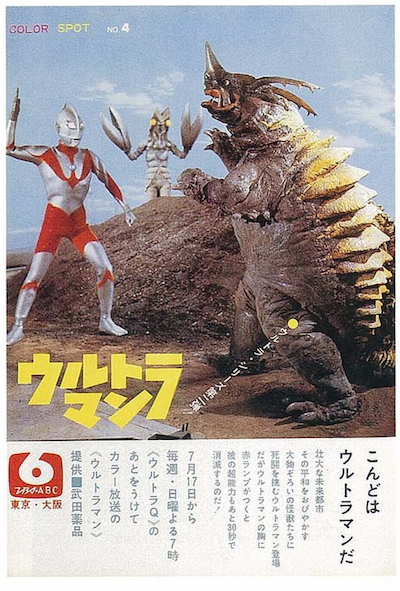 Bowing on Japan's TBS television network on July 17, 1966, Tsuburaya Productions' ULTRAMAN was not only an instant and colossal success at home, but also abroad, as it was syndicated to North America and Latin American countries through United Artists Television. Creating generations of fans across the globe, with new incarnations appearing on television and cinema screens, as well as the originals, thrilling both old and new, alike. As a five year old, I was captivated by those daily doses of ultra kaiju action which flooded into my living room every weekday, and left an permanent mark upon my young psyche. A malady from which I never recovered. Despite vanishing from local airwaves, this wondrous sci-fi action series remained in my mind. In those days, there was little or no merchandise to be found in the US, until a fateful school field trip to San Francisco's Japantown changed everything. Toys, books, magazines, records, and more were laid before me in now-defunct shops such as Goshado, Nichibei Bussan, and Mikado. Not only was there an entire Ultra Family, an entirely new world superheroes and monsters flooded into my consciousness, and so my fate was sealed. It was not long afterwards that ULTRAMAN returned to Northern California television, and this time, we would not be separated ever again. While I live and breathe the vast pantheon of Japanese superheroes and kaiju, both great and small, my favorite series and my eternally favorite savior from the stars will always be the original Ultraman — protector of the world! In honor of this anniversary, I will be posting a number of Ultraman-related pieces all month, so happy anniversary to ULTRAMAN, one of the greatest television series of all time! And remember, it's all your fault (just kidding). You can stream all 39 episodes of the original, uncut ULTRAMAN, with English Subtitles, for free at Shout Factory TV! I will not go to school on an empty stomach! I will go out and play when the weather is good. I will watch out for cars when crossing the street. I will not rely on others. I will play and run around barefoot!